The driver of a car has had a very lucky escape after it got trapped under the side of an HGV on the M6 close to the Staffordshire / Black Country border. 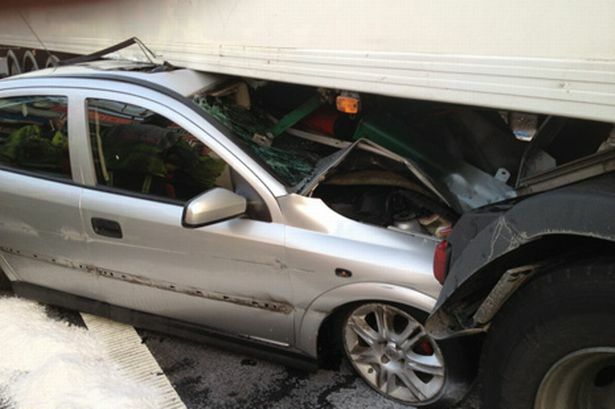 A motorist escaped with minor injuries after car became trapped under a lorry on the M6. A West Midlands Ambulance Service spokesman said: “On arrival crews found a car wedged under the side of a lorry and there was a large amount of intrusion into the vehicle. “Despite the damage, the driver of the car, a man estimated to be in his 20s was able to get out relatively easily. “The man was checked over at the scene by the doctor. Amazingly, it appears as though he has suffered only minor abdominal injuries. "However, as a precaution, he was taken by ambulance to the Major Trauma Centre at Queen Elizabeth Hospital Birmingham.